This progressive rock outfit formed in 1971 in Hatfield, Hertfordshire. They were originally known as Shacklock after their founder member Alan Shacklock (ex-Juniors), but adopted the name Babe Ruth after the legendary American baseball player after the release of their debut album. The album didn't make much impression here in the UK but went gold in Canada. Ed Spevock (ex-Pete Brown's Piblokto) and Chris Holmes (ex-Timebox) both joined the group for their second album. Steve Gurl, formerly of Wild Turkey, was added to the line-up shortly prior to the release of their third album which climbed to No 75 in the US Charts. The band was now under considerable demand to tour the US but these demands gradually brought about their demise. Firstly, their founder Alan Shacklock left to be replaced by Bernie Marsden (who was also formerly with Wild Turkey and UFO), and then after the Stealin' Home album had met with some success here in the UK both Jenny Haan and Dave Hewitt left in short succession. 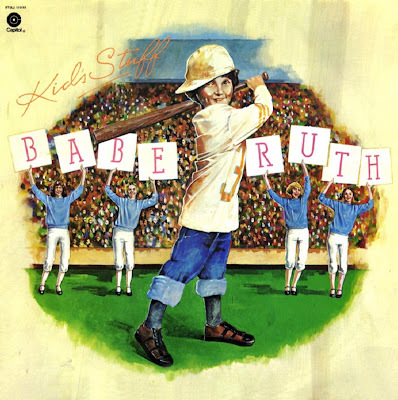 Ray Knott and Ellie Hope, who'd played with an obscure girl group Ellie, were enlisted in their place and this line-up recorded Kid's Stuff, which proved to be their final album, aside from the obligatory Best Of compilation. Finally Alan Ross replaced Bernie Marsden just before the band split in '76. After their demise Bernie Marsden went on to play for Whitesnake; Janita 'Jenny' Haan formed her own band, Jenny Haan's Lion; and both Ray Knott and Ellie Hope were in Liquid Gold in the late 70s. Ellie Hope also later recorded a solo single. Janita 'Jenny' Haan also sang on Strider's 1974 album, Misunderstanding.